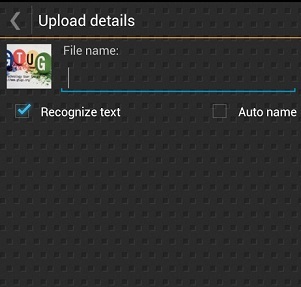 Along with bug fixes for Android 4.1 Jelly Bean, Droid Scan 5.4.3 implements one of the most requested items on our wish list: batch JPEG upload to Evernote. This is made possible by a new feature called "intelligent JPEG sharing," which shares JPEG scans all at once with apps (like Evernote) that support it, and one at a time with apps that work better that way (for example, the built-in Google Drive uploader with OCR, and Google Goggles). The enhanced Drive uploader with thumbnails, a useful visual reminder when uploading a list of scans.